With over 30 years in the saddle and over 20 years performing on stage Rob's show has taken him all over the world. Performances for dozens of circus and variety shows including Cirque du Soleil and the Royal Variety Performance for Queen Elizabeth II. However it doesn't stop there he has performed at hundreds of special events for companies like IAA, VW, and Porsche just to mention a few. Rob's most recent shows are now with cruise lines where he is performing a 20 minute show with comedy and audience participation. On top of this together with his wife Andrea they perform a 45 minute BMX and Aerial acrobatics show with costume quick-change and comedy. The show is called "Love is in the Air" you can find video and photos from all of these shows right here at robalton.com. Rob is the youngest of 3 brothers. 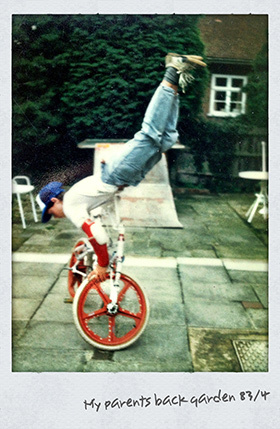 Steve, the middle of the "Alton Boys", started riding BMX bikes when the craze started in the early eighties. After three years, however, Steve decided to hand-down his bike to Rob. The youngster quickly grasped the basics and soon grew to love his newly-found sport. By the age of 13 he was completely addicted; riding every day and learning new tricks all the time. After a year of committed progress, Rob considered himself good enough to compete. 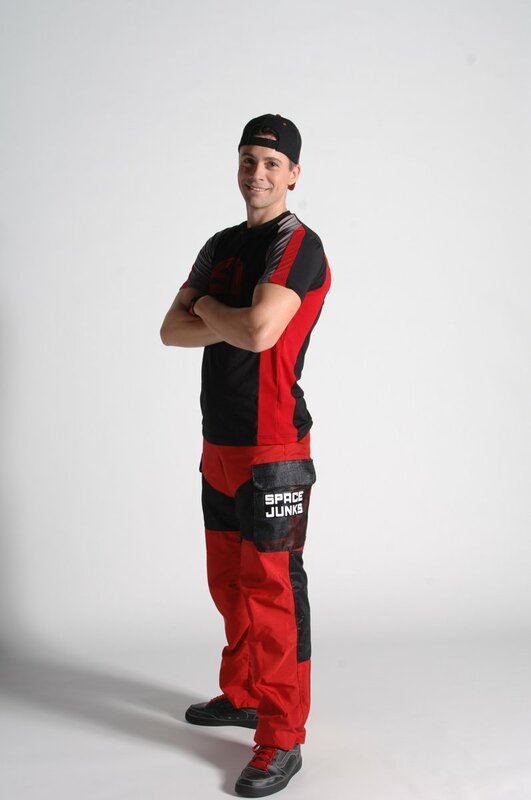 He joined the United Kingdom Bicycle Freestyle Association and was soon traveling the country to and from a variety of competitions. Rob left school and began work as an apprentice green keeper at Hadley Wood Golf Club in Potters Bar. Despite working from 7am - 4pm most days, he still found time to practice for at least 3 hours every day. It will come as no surprise to learn that Rob soon began to create his own style of riding - as well as a number of unique tricks. As time passed, Rob rose quickly to the top of his sport, qualifying for all the major competitions. In 1987 he competed in the BMX World Championships and only missed-out on the final by a single point! No matter; undeterred Rob continued to train hard and a year later his dedication began to pay dividends. At the 1988 World Championships Rob finished in second place. Rob's new style of riding had begun to make him stand out from the other riders. This style became his trade-mark and, by the end of 1988, he was winning almost every competition that he entered. He success in the arena was matched only by the attention he demanded in the world of BMX advertising. By the end of the year Rob would soon be sponsored by both Haro Bikes and Vision Street Wear. In 1989 the World Championships were held in Paris. There were over 40 riders from all over the world. True to form, however, Rob was determined to make this competition his own and, in typically dynamic fashion, he won the title of World BMX Flatland Champion "hands down". Rob Alton's star had finally risen! By the end of 1990 after competing on another hectic circuit, promoting Haro Bikes and Vision Street Wear, Rob made something of a surprising career move. By now, he had been working at the golf club for almost 4 years and was looking for a change of life. That change would come in the form of Gerry Cottle's Circus, which visited his home town in Potters Bar. Rob approached the circus owners and effectively demanded an audition. He was convinced that his BMX performance could and would be appreciated by a far wider audience. He was right! The circus owners were so impressed they offered him a contract there and then. In 1991 Rob became a performer with the internationally renowned "Continental Circus Berlin". It was the start of a remarkable relationship, throughout which both Rob and the circuses he worked with were to benefit. What's more, it is a relationship that continues to this day. Rob is now a seasoned performer, his career spanning over ten years and ten times as many venues. From circus to nightclub, theatre to gala, Rob has played them all and been back for more. Between engagements, he has managed to find time to meet his wife, Andrea Tomko, herself an experienced aerial artiste and graduate of the Hungarian State Circus School. The two were married in Budapest in 1998. Needless to say, their activities didn't stop there. Just 3 years later, on July 25th 2001, Andrea gave birth to Sophie-Maria. This latest addition to the newly formed Alton "trio" certainly has a lot to live up to. Then again, if she's only half as talented as her parents, her success as a performer is guaranteed. There have been many highlights in my career over the years and I guess one of the biggest would have to be my two years with Cirque du Soleil's production of "La Nouba", a resident show based in Orlando at Downtown Disney. The show name La Nouba originates from the French phrase "faire la nouba," which means to party, to live it up. It is a world where dreams and reality intertwine as the urban and circus worlds meet on stage. Blending acrobatics, dazzling choreography, whimsical characters and live music, La Nouba stimulates our imagination from beginning to end. I performed almost 1000 shows in my time there and it was truly an amazing experience. For a full list of all my performances please see my "work" page. A lot of riders and performers have asked me why I left La Nouba . The answer, in 2004 the U.S. Homeland Security changed some of the laws for getting in and out of the U.S. making it very difficult for foreign workers to travel in and out of the country. So, with many friends, collegues and family in Europe I had no choice but to return home and and make my mark once again in the European entertainment scene. Another great highlight was when I performed for the Queen of England! Not many people can say they met the Queen of England. I had that privilege and performed for her too in The Royal Variety Performance. The 77th Royal Variety Performance was presented on November 21, 2005 in the presence of Her Majesty Queen Elizabeth II and His Royal Highness the Duke of Edinburgh, at Wales Millennium Center. Blue Man Group, as well as Charlotte Church, Andrea Bocelli and Ozzy Osbourne, performed to the sell-out crowd of 1800 people. The performance was aired in the UK on December 11, 2005. The first Royal Show was on July 1, 1912 at The Palace Theatre in the presence of Their Majesties King George V and Queen Mary. Afterwards, the King said he would attend a once-yearly variety show provided the profits went to the Variety Artistes Benevolent Fund as The Entertainment Artistes Benevolent Fund was then known. The Royal Variety Performance provides support for retired members of the entertainment profession and their dependants.